"Harbour rots ships and ruins men". So said Horatio Nelson. He not only knew it from his own extensive command experience, but from time to time during long stays in port, he proved it personally with cringe-making results. He should have remembered that other saying of the sea: A busy ship is a happy ship. 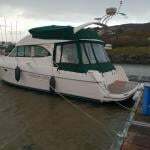 And at a more basic level, surveyors and boat maintenance experts will tell you the simple truth, that boats and their equipment usually don't get worn out, but they slowly rot through disuse. With modern materials, it's not rot as they'd have known it in Nelson's day. But whatever you might call it, it makes things non-functional. Yet a boat which is on the move - sailing regularly and extensively - soon has everything working sweetly, for the demands of the sea are such that the attitude of "sure 'twill do" soon provides its own come-uppance. Out in the west, they've an attractive boat which is making a fair bid to be a perpetual motion machine, with everything functioning smoothly. It's not that long ago that Martin Breen of Galway bought the Reflex 38 Lynx, but since then she has been in the frame in so many major offshore events, and under so many different sponsorship names, that you could be forgiven for thinking he's owned her for more than a decade, and that there are two or three different boats involved. At the time he bought her, we noted that she seemed to be the ideal size of boat for Irish conditions. The First 40.7, globally the most successful production-built frontline offshore racer of the past twenty years and a super boat with it, is just that little bit too big for Irish conditions in terms of personnel demands and maintenance requirements. But if you go down to some of the hotter 36ft and 34ft machines, you often find you're missing the boat in terms of catching tidal patterns, and the basic realities of seagoing comfort, even though the brilliant J/109 frequently proves otherwise. But 38ft LOA - that is just spot on. When Christian Stimson created what is now the Reflex 38 in 1998, he came up with a concept which has withstood the test of time. 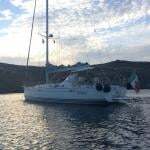 She can sail up to her rating, and has proven a steady and successful performer in a wide variety of conditions, proving that the comment by Robert Scheidt - that sailing is a consistency sport - applies every bit as much offshore as in the bays. 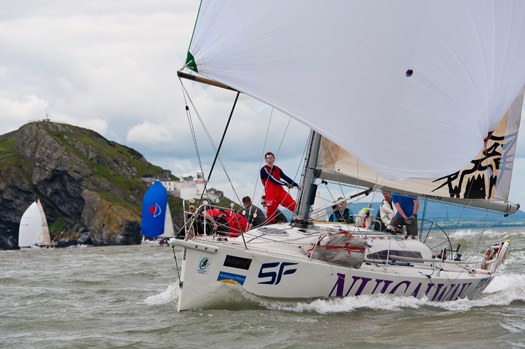 The new Breen boat made her Irish debut with the Dun Laoghaire-Dingle Race in 2011, and really stuffed it into the fleets from other Irish coasts, for she raced as Galway Harbour, and had an excellent overall win. Then last year it was active members of NUI Galway SC past and present who took her over under the leadership of Cathal Clarke, and they became the ICRA Boat of the Year with a superb all-round programme which included a class win in a major ISORA race, and the class win – including beating the hottest Reflex 38 from Britain – in the Round Ireland Race. Between times, the boat didn't rest, as Martin Breen has his own crew for inshore regattas. But this year, the pace is into an even higher gear with Aodhan Fitzgerald (who has been involved since the boat first reached Ireland) in overall charge offshore in a programme which is simply mind-boggling. It was launched yesterday evening in Galway with the boat now in the Discover Ireland livery, and she'll be promoting the Emerald Isle and The Gathering Cruise in a series of campaigns which start today off Rinville at 1000hrs with the 60-mile Clarenbridge Crystal Race in Galway Bay. The crew will be clad from head to toe in new kit provided by Dubarry, with the boat setting a fine new set of threads from Des McWilliam, saling in conditions which look most unlikely to include any calm spots. Then it's off to Scotland round Ireland's bumpy nor'west corner for the Scottish Series from May 24th to 27th with the boat to be raced by Martin Breen's GBSC team, then south to Dun Laoghaire to be on station for defending the Dun Laoghaire to Dingle title, starting the 266 mile course (which is also a Fastnet qualifier) on June 7th, then on from Dingle it's immediately into the WIORA and ICRA championships just round the corner at Fenit on Tralee Bay, then before June is out, they're challenging for the Sovereign's Cup in Kinsale. The total crew panel is 15, ranging in age from 19 to 55, and for the offshore programme the lineup is Aodhan Fitzgerald (skipper/navigator), Johnny Murphy (tactician/trimmer), Neil Spain (driver), Ben Scallan (driver), Martin Breen (driver), Cathal Clarke (bowman), Joan Mulloy (trimmer), Nigel Moss (trimmer), Ruairi de Faoite (mast), and Louis Mulloy (bowman). While the crew emphasis is on Connacht, in the way of offshore racing this team also includes people from most other parts of Ireland, people that you'd meet in the course of other campaigns, people who seem to fit in with your own boat's way of doing things. If you tried to delineate a clear career path on how to become part of a group like this, you'd find it very difficult. There is no clearcut way. It seems to happen by a mixture of telepathy and osmosis. You are impressed by the way people are sailing another boat, and you make it your business to get them inside your tent. Because for sure, the business of successfully balancing different temperaments is going to be paramount in a season in which they're only getting going as the Sovereign's Cup draws to a close. The high point of the year is going to be the Rolex Fastnet Race in August. By the time the boat gets to Cowes, she'll have sailed more than a thousand miles in delivery trips. Stating the obvious? Starting the Rolex Fastnet Race with this message emblazoned on your topsides is going to invite ribald comment from the opposition. But displaying something similar has proven successful in the past. And there she'll be in the Solent among 350 other Fastnet wannabees, with Discover Ireland boldly displayed along her topsides. They'll be getting some smartass comments about that. After all, what else is the Fastnet Race all about? Back in 1975, when the Golden Jubilee Fastnet Race included a fleet for classics racing for the Iolaire Block presented by Don Street, one splendid old gaff cutter had her crew all kitted out in crisp new T-shirts, each one imprinted with different letters. When they all lined up along the rail, those T-shirts read: "What is the way to the Fastnet Rock, please?" In Irish. And it worked. They won the Iolaire Block, even though Iolaire was herself racing. So let's hope that having discoverireland.ie emblazoned prominently on the topsides is going to be equally successful in the Fastnet Race for the boat formerly known as Lynx. What with this extraordinary campaign, and the news this week about Galway plunging ahead with its new harbour, it's very clear that in the 21st Century, it's totally superfluous to warble on about the west being awake. For a long time now, it hasn't been asleep.